In the first part of this series we looked at general multi-threading and multi-core programming concepts without getting into the meat of any real problems, and in the second part we looked at the theory and application of the parallel aggregation pattern using either C++11’s standard thread library or Boost using classical parallel programming techniques. In this part we shall solve exactly the same summation problem from part 2 (adding all the numbers from 0 to 1 billion) but use the new Parallel Patterns Library (PPL) to do so. We will first look at a direct port using classical parallel programming techniques, then find out how to leverage new language features in C++11 which are employed by PPL to simplify the code and write parallel algorithms using an entirely new paradigm. We shall also look at some fundamental differences between PPL and other multi-threading/multi-core libraries, the pros and cons, and some gotchas to be aware of. This tutorial will assume you have at least read the non-coding sections of part 2 of this series, so that you understand the problem we are trying to solve, the underlying algorithm and some of the problems that can crop up. Once again, we will use a Core i7-2600K CPU with 6GB of DDR-1600 RAM when benchmarking performance. This article is primarily focused on Windows, but a related library called PPLx exists which provides very similar functionality for Linux, so any non-Windows code below will apply equally to PPLx. ConcRT differs from traditional paradigm of leaving it up to the application to distribute specific-sized parcels of work across a specific number of threads by using something called a work-stealing algorithm. This is essentially a form of load balancing: consider the case where you allocate 5 units of work to thread A and 2 units to thread B. Traditionally, if we assume thread B finishes first, we end up waiting on thread A. ConcRT will automatically detect when a thread finishes its work and transfer (steal) work from another thread with a remaining backlog (in this case, thread B will steal work from thread A) to minimize the amount of waiting and thread idling, and therefore minimize the total execution time. In addition, this frees the application from having to compute or estimate the optimum number of threads or cores to use: the load balancing in ConcRT will take care of it automatically. If you do need finer-grained control, you can use partitioning strategies which are discussed below. PPL also provides objects which can be used to store and combine partial results from a parallel aggregation task in a thread-safe manner. More on this below. std::cout << "Time taken with " << cores_to_use << " core" << (cores_to_use != 1? "s":"") << ": "
In the version using the C++ thread library, we iterate over all the std::threads and call join() on them to wait for them to finish one at a time. Since a PPL task group manages all the threads involved, there is no need for a for loop; wait() will block until all of the tasks in the task group have finished, then return. The actual algorithm used to apportion the work into equal chunks (besides possibly the last chunk) and the method of aggregating the partial results into a final result is identical in both concept and code to the C++11 standard thread library example in part 2 – refer to that article for the full details. Performance-wise, changing the use of std::thread to PPL tasks results in comparable execution times (see figure 1). If the work unit sizes were more uneven, the work-stealing algorithm in ConcRT would make the task group version slightly faster, but in this case where the work unit sizes are the same, performance is more or less identical to managing the threads directly. by using the local() method we can read and write a thread-private or thread-local instance of the object’s template type parameter (uint64_t in this case). We don’t need to worry about synchronization objects, or allocating/releasing memory for partial results, or providing the thread function with pointers to their own partial result storage. We can just call local() to access our result storage location. On the benchmark machine, the version using the critical section runs approximately 15 times slower than the version without – see figure 2. Watching CPU resource use during execution also shows that the CPU is only under an approximate 20% load in total, meaning that it is spending 80% of its time stalling and waiting for critical sections to be exited in other threads, whereas the basic parallel_for loop without critical sections puts the CPU under the desired 100% load, using all available processing resources. Unfortunately, even without using a critical section, the performance of the parallel_for loop in the example above is very slow compared to our expectations, as figure 2 again shows. 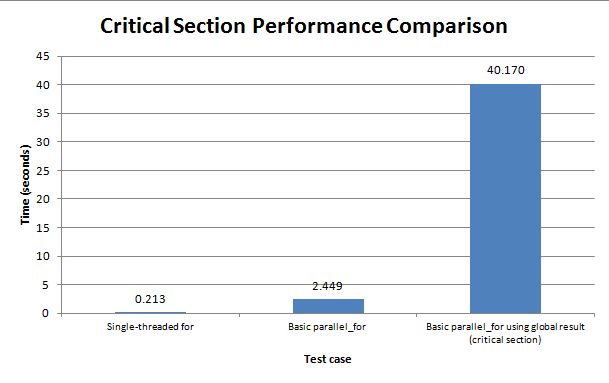 While performance on the benchmark machine using the C++11 standard thread library and PPL task groups is comparable (0.08 seconds), and a single-threaded sequential for loop is slower as expected (0.21 seconds), using the parallel_for loop takes a whopping 2.4 seconds – over 10 times slower than the single-threaded for loop! What is going on here? Read on to find out. The first problem can be solved by making each call to the thread function (the function we pass to parallel_for) do more work. Rather than only adding one number to the total, we can parcel up blocks of work similar to in the C++11 standard thread library and PPL task group examples and make each function call do a block of additions. Each thread will then store its own partial result in a combinable object and we’ll sum the partial results when all the threads have finished, just like before. Note this somewhat defeats the point of using parallel_for to simplify parallel programming because we are still having to re-design the algorithm, but it is only a problem with small loop bodies; more typically used complex code will work just fine and see a good performance benefit using the basic technique in the previous section, without further modification. However, the issue with small loop bodies is a common gotcha so I thought it worth exploring further. We have essentially replaced the single addition with a standard for loop that performs a series of additions (I have called this kind of construct a ‘chunked parallel_for loop’ in figure 3, as we are splitting the work into chunks). Here we have split the work equally across a number of threads equal to the number of processor cores (as returned by GetProcessorCount()), but you can use any number of threads you choose. Note that we have now lost the flexibility to not worry about how much thread does how much work: if all of the work unit sizes are not the same (for example if GetProcessorCount() is not exactly divisible into the problem size, or if you replace the call with some arbitrary number of threads which are not exactly divisible into the problem size), you will get an incorrect result. Performance-wise, figure 3 shows an average time of about 1.88 seconds for this version – still much slower than the single-threaded version, but about 25% faster than our first attempt at parallel_for. It’s a start. We call local() only once, before the for loop, save the reference in part_result and use this as the storage target when doing the additions. Figure 3 shows the dramatic performance gain achieved: at around 0.4 seconds, this is over 4 times faster than the previous version, yet still twice as slow as the single-threaded version! 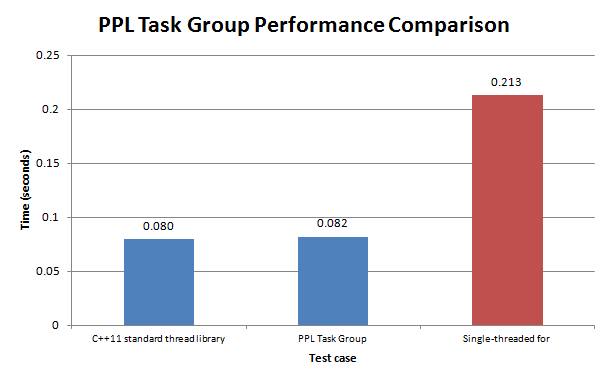 Figure 3 shows the performance: at 0.085 seconds, it is comparable with the standard thread library and PPL task groups, and therefore runs at the expected speed. NOTE: It is very important that you add your temporary partial results to part_sums.local() and not assign them directly. This is because the work-stealing algorithm may add extra work (in the form of another call to this function) to a thread after the first run of the for loop completes, which means part_sums.local() will already be initialized with a value which is part of the total result. If you just assign to part_sums.local() directly, you overwrite any previous results calculated in the same thread and may finish with an incorrect total result. Partitioning is the mechanism ConcRT uses to decide how much work of a parallel_for or other construct to give to each thread. When you use the basic (non-chunked) parallel_for loop for example, ConcRT’s partitioning strategy decides how many iterations of the function will run on how many threads, and this is the reason you don’t need to specify a workload size for each thread individually. The default strategy is called auto_partitioner and splits the work into ranges, and these ranges into sub-ranges, then employs the work-stealing algorithm to move the sub-ranges around to the least backlogged threads, essentially performing load balancing as discussed earlier. For our chunked version of the code, this has a down-side: we have already calculated the ranges (workload sizes per thread) ourselves and we don’t want or need load balancing. This extra management performed by auto_partitioner then just becomes an unnecessary overhead. Even with the non-chunked version, since our loop iterations are so simple, the overhead of load balancing may end up costing more time than it saves. Fortunately, when you call parallel_for you can specify as a final optional argument an alternative partitioning strategy to use instead of auto_partitioner. For our purposes, the static_partitioner strategy is a good match: it splits the work into ranges and assigns one range to each thread. No work-stealing/load balancing is used, and the ranges are not divided into sub-ranges for this purpose. The documentation states: “Use this partitioner type when each iteration of a parallel loop performs a fixed and uniform amount of work…”. If you want to ensure that each range has a certain minimum size, you can use simple_partitioner. simple_partitioner takes a single argument which specifies the minimum number of iterations of the parallel_for which should run on each thread (ie. the minimum range size). Work-stealing is still performed but only once the specified minimum number of iterations has completed, and the ranges are not split into sub-ranges. Essentially then, work-stealing can only occur if an entire range completes before another one on another thread has started. WARNING: In previous versions of PPL there was no modifiable partitioning strategy. Users were required to install the Concurrency Runtime Sample Pack, include ConcRTExtras/ppl_extras.h and use samples::parallel_for_fixed to have the same effect as calling parallel_for with static_partitioner. The Microsoft documentation is still out-of-date in this regard and you will find many references to parallel_for_fixed and related functions on MSDN. The current version of PPL implements partitioning strategy as the optional final argument as a replacement to these functions. Do not use the Concurrency Runtime Sample Pack for partitioning. 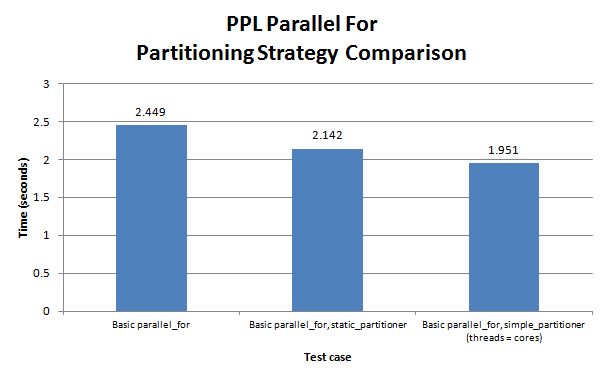 By simply adding static_partitioner() as the final argument to parallel_for, we change the partitioning strategy in use. Figures 4 and 5 show the relative performance of the mentioned partitioner types. In the standard (non-chunked case), we set the range size in simple_partitioner such that it is exactly divisible into the number of processor cores available, such that each core is used and given an initially equal amount of work. In the chunked case, we set the range size to 1 when we use simple_partitioner, because we have already divided the work into a number of chunks equal to the number of processor cores and each iteration of the parallel_for is meant to run exactly once on each core, in contrast to the standard parallel_for use. As you can see, in our summation problem the simple_partitioner wins out in all cases, although both simple_partitioner and static_partitioner bring performance benefits over the default auto_partitioner, particularly in the standard (non-chunked) case. 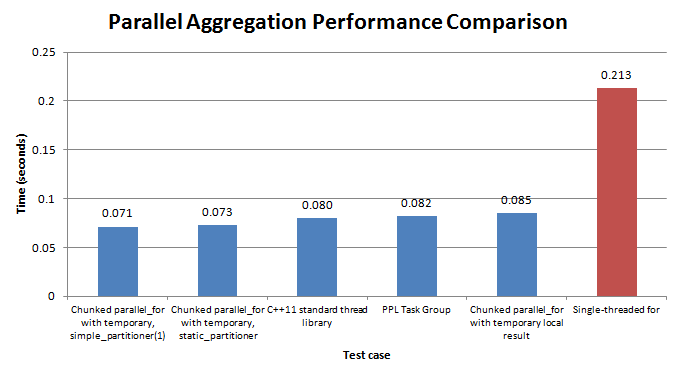 Figure 6 shows all the PPL solutions we have tried which improve performance over the single-threaded implementation. 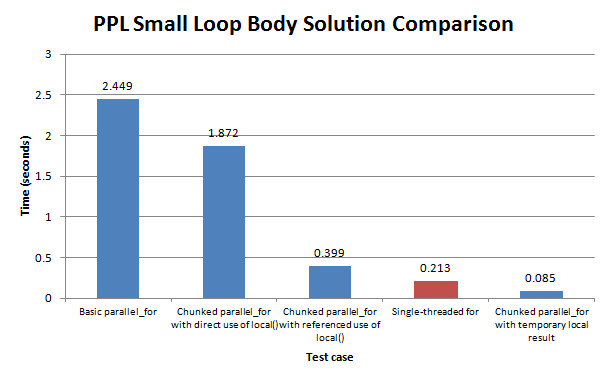 As you can see, with small loop bodies, the chunking approach discussed above (without using local() until the entire chunk of work is finished) is the optimal solution, with performance comparable to the thread library and task groups. parallel_for is preferred over task groups (whether chunked or not) for this kind of problem, where the tasks use identical code with different data. Task groups should be used when each task requires different code (ie. several unrelated tasks). Using the simple or static partitioning strategies can lead to additional performance gains, but check during development as your mileage may vary depending on the computations being performed. Standard (non-chunked) parallel_for is preferred where the tasks have more complexity than a single line of code, and in those cases performance should again be comparable to the thread library and task groups. This concludes our exploration of parallel aggregation in PPL. I hope you found it useful! Love your blog, your articles about ppl.h help me a lot! Thank you! Hi, this article is great, but I have one question: what is the way to put result of every task into one unordered_map? Other words: how to do return of every task? I am trying to do it since days, but I haven’t idea.